As we’ve mentioned elsewhere in this issue of NASA Goddard Tech Transfer News, the GPM mission is the first to coordinate a network of international satellites (current and planned) to produce the next generation of data on global precipitation. The star of the mission is the GPM Core Observatory, launched in February of 2014. It carries an advanced radar/radiometer system and serves as a reference standard that will unify precipitation measurements from the constellation. To do this, technology had to be developed that could link the data from the GPM Core Observatory to ground based measurement systems, validate the data they produced, and calibrate them continually. That technology is D3R. Remote Sensing Solutions received a Phase I and Phase II SBIR award to develop the D3R or Dual-wavelength, Dual-polarized Doppler Precipitation Radar specifically for the GPM mission. The goal was to design a portable, all-weather multi-wavelength antenna that would act as the ground base calibration and validation system for GSFC’s cloud and precipitation measuring mission (the GPM mission). The company leveraged this novel waveform and transceiver design and in a Phase III SBIR project, worked with Colorado State University and GSFC to complete the design of D3R. The radar simultaneously acquires dual-polarized Doppler and reflectivity precipitation volume backscatter measurements in the Ka and Ku band wavelengths with sensitivity close to traditional tube-based precipitation radar but eliminates the blind region. 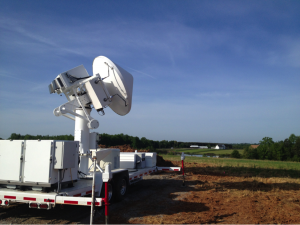 The design provides the Ku-band ((14 GHz) and Ka-band (35 GHz) channels to receive data from GPM Core Observatory and provide the calibration and validation, or calval, necessary to continually modify the data collection from the constellation. The antenna is a key technology element for this mission as the calval ability allows the mission to constantly update its own performance. Further, acquiring data in Ku and Ka band wavelengths creates a system with multiple “channels” that can see precipitation in clouds from low level rain to high level snow and ice. The multiple channel approach to precipitation measurement is one of the reasons the GPM mission can more precisely quantify precipitation, yielding unprecedented data on global precipitation. It also creates a system that can use improvement algorithms for space-borne and long range ground-based cloud and weather radars (this is the calval component of the system). Remote Sensing Solutions believes this technology can, with minor modifications, be used for a broad range of “terrestrial” uses and plans to pursue those potential markets.